Electrical resistance is a measure of the degree to which an object opposes the passage of an electric current. The SI unit of electrical resistance is the ohm. Its reciprocal quantity is electrical conductance measured in siemens. Resistance is the property of any object or substance of resisting or opposing the flow of an electrical current. The quantity of resistance in an electric circuit determines the amount of current flowing in the circuit for any given voltage applied to the circuit. The gradient of the line should be . The worst case difference between the data point and the best fit line is -117%. The % uncertainty in R should be about ±14% according to the calculation. However, the worse difference is –117%. 1% error during the measurement of length of wire. 27% error during the measurement of diameter of wire. 14% error when reading the ammeter and voltage. Measure the thickness of the wire at as many places as possible. Use as many significance as the ammeter and voltmeter can use. The final uncertainty for the experiment is 100%. This is a good report but a lack of conclusion and some significant errors in analysis of uncertainties have let it down somewhat. The writer initially makes clear what the task is and how they approach it. 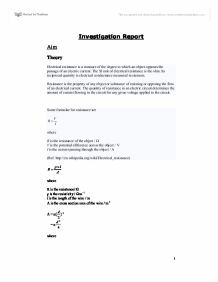 The explanation of the equations are good but the full derivation and rearrangement isn't required in this type of report. For a final report, the full results before averages are taken should be relegated to an appendix. The biggest problem is that the results are actually OK and the final graph reasonable. The actual uncertainty is approximately 10% rather than the 100% quoted. This can be determined from your graphing software, which usually has a value for this. The physical concepts aren't discussed in particular detail but it is largely accurate, with some relevant physics discussed. The layout is good with good spelling, punctuation and grammar in general. The appropriate scientific terms are spelt correctly. Overall, a good report with some room for improvement. + ? ? = 1.54 volts Discussion: Table one; The result from table one of an old battery, occupied small readings (intervals) of the currents of 0.1 amps together with the value of uncertainty of � 0.1, and these values altered the value of the voltage. Voltage regulation is the change in the secondary voltage between no-load and full-load. It is expressed as a fraction (either per-unit or per-cent) of the no-load voltage with the primary voltage with the primary voltage assumed constant. Efficiency is the ratio of output power and input power. C with a thermometer so the change in temperature can be determined. Method: (Trial Run) * First I lagged the aluminium block with polystyrene and aluminium foil to reduce heat loss by convection, conduction and radiation. * Connect circuit as shown in the above diagram. From fig 1, it is evident, that ohms law is applicable. All the points lying on the best-fit line demonstrate this. The resistance, was first calculated by using ohms law, of V=IR, which was rearranged to R=V/I. 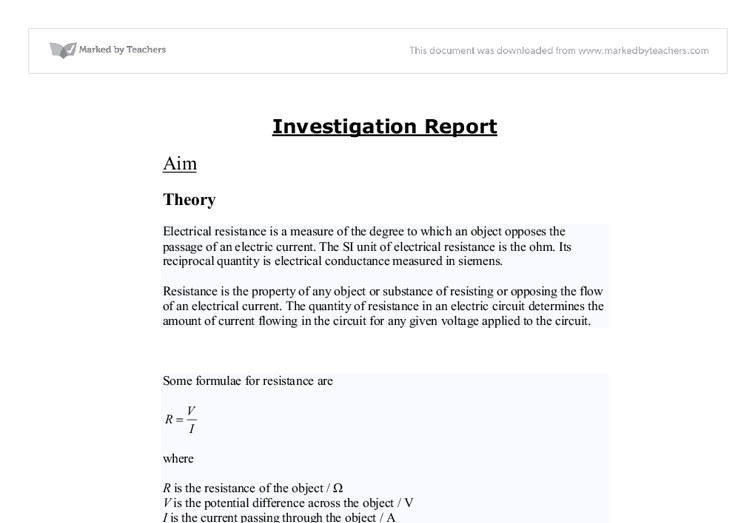 As seen on the table of results, for 1 ohm resistor, the resistance received by using the formula, was 1.11 ohms.